It’s that time of year again to sign your kids up for winter sporting teams. Whether it is soccer, netball, hockey, and the list goes on. 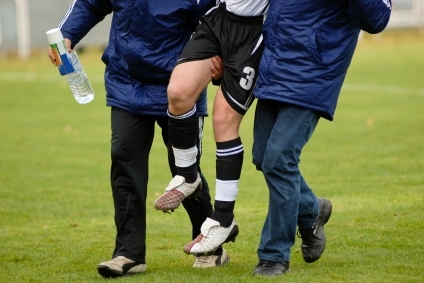 During the sporting season the occasional rolled or sprained ankle may occur especially in sports which require a lot of running and change of direction. Therefore it is valuable for parents to be familiar with RICE, an acronym that is helpful in remembering the steps of injury first-aid. RICE stands for rest, ice, compression and elevation. The earlier RICE is applied to an injury the better. If applied immediately there will be a decrease in pain, swelling and if followed correctly it may also reduce healing time. Rest For the first 24-48 hours after an injury occurs do not participate in any activity that causes the pain to increase. It is best to avoid putting weight on the injured foot during this time. Resting allows time for the body to heal and prevents re injury from occurring. Ice Apply ice to the injured area for approximately 20 minutes every 4 hours. Ice helps to reduce pain and swelling. Ice packs are cheap, effective and they are commonly kept as part of a first aid kit. It is a good idea to wrap the ice pack in a tea towel to protect the skin. They are effective as they can be molded to the foot or ankle and held in place with a bandage. If an ice pack is not available a packet of frozen vegetables from the freezer will serve the same purpose. Compression Compress the ankle or foot with a bandage to help reduce swelling and support the foot while it heals. Make sure the bandage is not too tight and it should be removed at night when sleeping. Elevation Try to position the foot and ankle so that it is elevated as this helps to reduce swelling and bruising. As the foot is lower down, gravity encourages swelling and blood flow down to this lower point, elevation helps to minimise this. If possible a higher position than your heart is ideal. This can be achieved by lying down and placing pillows under your foot. After the initial rest period of 24-48 hours a gradual return to activity should occur. However, if the pain and swelling has not decreased after a few days and only minimal improvement is observed seek further advice from your local podiatrist.